In 1955 Alan Manson was called before the HUAC investgating communists in the NY theater, but refused to answer questions. He was later cleared but found little acting work afterwards. Alan Manson (06-07-1918 - 03-05-2002) Age 84 Alan Manson was one of a group of World War II soldiers selected to appear in Irving Berlin's 1942 musical This Is the Army (1943) (and the film as well). He appeared in the Broadway production like Paddy Chayefsky's "The Tenth Man", "Call Me Mister" and Rogers & Hammerstein's "Allegro" and "Angels Kiss Me". He also appeared as Florenz Ziegfeld Jr., opposite Barbra Streisand's Fanny Brice, in the Broadway production of "Funny Girl". After the war, he continued to perform on Broadway. Going on to appear in guest spots on many television shows beginning in the 1960's. 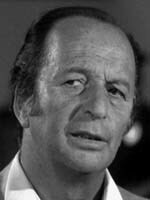 in addition to his Law And Order appearances, Alan would appear on such popular series such as Car 54, Where Are You?, The Patty Duke Show, Cannon, M*A*S*H, The Bob Newhart Show, The Mary Tyler Moore Show, The Six Million Dollar Man, Three's Company, Charlie's Angels,The Jeffersons, Kojak, and Vega$.